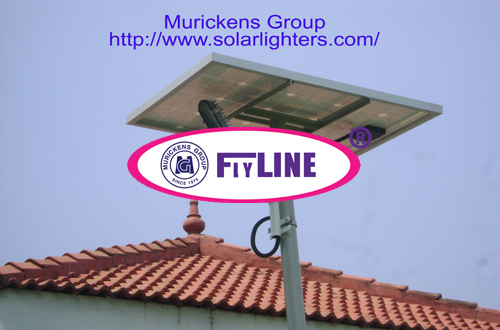 Murickens developed "Flyline renewable energy lighting” with the aim of save nation and money. It is a simple and compact system works with the help of solar power. Using solar energy module supply DC power is used for the smooth functioning of DC lights. It is ideal for Indian climate especially in Kerala . Our product is IEC and ISO certified and as per MNRE spec.Flyline solar standalone independent street light system is available in 3 to 60 watts. There are two types of DC systems one is used for dawn to dusk independent model like street light advertising board lights and garden lights. This entire system consists of Flyline LED lamp with charging control system, solar panel and battery. Another one home DC lighting system on–off function, control with our discretion. Through this system we can work DC fan, Dc lights, mobile charger and other DC electronic equipments. This unit includes charging control unit home light luminary, storage back-up battery and solar panel. It is fully natural renewable energy based system with low maintenance. ► DC volt out put 12V or 24 V. ► MNRE approved ► German Technology assures the quality of flyline solar garden light.► ISO 9001- 2015 quality certified product ► Flyline solar luminary cabinet is weather proof so it is an Ideal for Streetlight, garden light, Gate light, and park light ► It have automatic control system (dawn to dusk) ► It is available in 3w, 6w, 9w, 12w, 18w and above. ► Dimmer option after 6 hours. ► By using powerful LED we get good brightness for the light. ► Its power consumption is very low and get very good back up. ► No need of wiring, so we can forget the headache of wiring and its expense. ► With the cost of AC cable and wiring, you can install a fly line full light system, with out electricity bill. ► We can charge the battery with the help of solar cell. ► Its Initial cost is also very low. ► No further expense. ► Very low maintenance. ► Specially designed compact control system protect the whole unit.